Ensure the writer is seated correctly with both hands on the table and the knees are at a right angle with their feet flat on the floor. It is important to have a good posture for writing. Hold the pencil/pen correctly in the dynamic tripod grip. 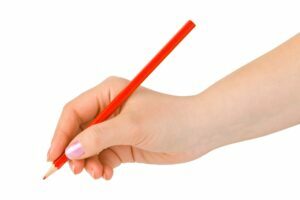 The correct pencil grip is important for the development of the finger movements for speed and fluency. We recommend the Grotto Grip and Sports Trainer which are available from our stockists. Slant the book at the correct angle, ensuring it is tipped so that the side of the paper is parallel to the writing arm. This will prevent the restriction of the writing forearm and hand. Do not press the pencil/pen too hard or grip too tightly. This makes writing a tiring activity. Ensure the writer has multiple opportunities to practise the correct direction and orientation of each letter or join. Constant repetition of the correct letter formation and joining direction ensures that the correct pathways are established in the muscle memory from the start. It is more time consuming to unpick the incorrect letter or join direction once a bad habit is embedded. Spend time developing and building up the muscles which are crucial to gripping a writing tool and the mechanics of writing. It is difficult to hold and steer the pencil/pen across the paper and sit with a good posture, if the writer has poor muscle strength. Playing with Play-Doh and Lego, cutting with scissors, climbing and playing racket sports all help to improve handwriting. Handwriting is a complex skill to master, which is why a high level of concentration is required from a child when they are learning to write. If you are introducing handwriting to your child before they begin preschool and primary school they will not be used to sitting down and concentrating for long periods of time. There are several things you can do to ensure your child is fully concentrating whilst learning to write. Firstly, you need to ensure that there are no distractions for your child whilst practising their writing – for example, no TV in the background. Consider creating an area for your child which is quiet and they have their own desk to sit and practise their handwriting. Secondly, you should also ensure that your child is not tired when they practise their handwriting, as this will most likely cause them to become uninterested very quickly. Finally, you need to ensure that you limit the time your child spends practising their writing. Before your child starts preschool or primary school, you should begin with 10 minutes and then you can gradually increase this when you feel it is appropriate. Limiting the time spent practising their writing will help to prevent your child becoming frustrated with their writing and forgetting everything they are being taught about how to write. 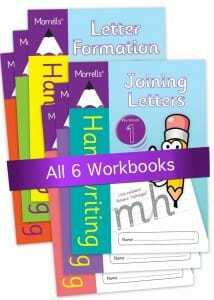 The Morrells Handwriting workbooks demonstrate the correct letter direction and the correct joining movement. Extensive directional arrows and a symbol to show the change of direction of the pencil, helps develop hand eye co-ordination and fine motor strength, while helping the writer to stretch the fine muscle movement required for steering the pencil across the paper. This embeds good handwriting habits. The progressive pattern repetition within the workbooks builds self-confidence, secretly enthusing, guiding and motivating the writer to complete challenging exercises that help handwriting to quickly become a muscle memory. Neat, legible handwriting quickly becomes routine, allowing the writer to devote all active thinking to the ideas that they are trying to express. The books are great, exactly what I was looking for. The methodology in our resources is aimed at building legible writing at speed which helps children to write effectively and keep up with the class. It is important that parents spend their time effectively using structured resources that achieve results and have a benefit to children in school which helps children to focus in the classroom. Teaching letter formation at home can provide vital assistance when children are going back into the classroom – there is no rush to teach children to join their letters. Mastering each step of the learning path produces long lasting results. Allowing children to experience a struggle to achieve a task helps their overall learning – know when to step in and provide help / assistance. It is never too late to correct illegibility with Morrells Handwriting.